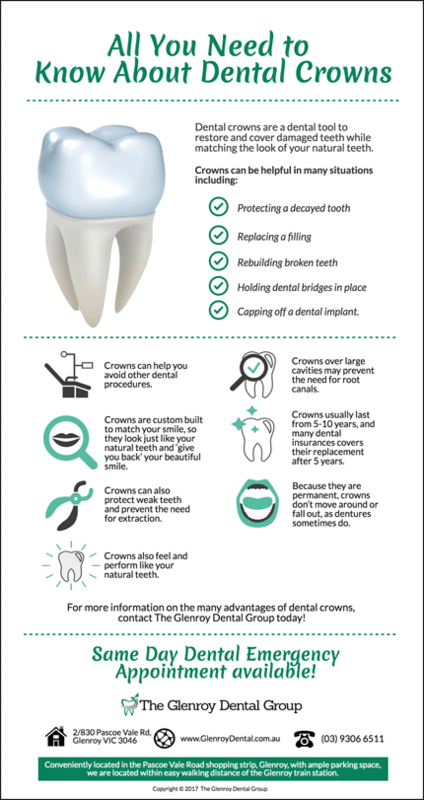 A crown is a tooth shaped cap that fits over a problem tooth to improve its strength, size, and appearance. It is ideal for protecting a cracked, broken tooth or covering up tooth discolorations. Crowns can be a great solution for improving your smile and bite. Crowns look great! A dentist can design and build a crown that will match your other teeth. The color, shape, and size of a crown can be adjusted so that a crown can give you back your beautiful smile. Crowns are relatively inexpensive, compared to other treatments that address some of the same dental problems. Crowns act like your natural teeth. They are strong and permanent and so they can be treated like your natural teeth. You can bite and chew without any worry! Crowns can be used to treat some unusually large cavities that otherwise would need to undergo a root canal. Crowns are long-lasting. A crown normally lasts from five to ten years and some can last even longer. A crown “gives back” a tooth’s original strength and function. Crowns also protect weak teeth and prevent the need for their extraction. Crowns are always there for you! Because they are fixed in your mouth, they do not move around. Some dental appliances can move, drop out, or be lost, but once crowns are in place? They stay there!